The second week of the 2018 Thursday Thunder Legends Series Presented by Papa John's Pizza season brought intense racing to a hot Georgia night as drivers competed for valuable points in the ten-week series. The Rookie Bandoleros Division kicked the night off with a 20-lap shootout feature. Lee Brown from Acworth took the lead on the first lap and fought off a persistent Nathaniel Harry of Concord, NC to take the checkered flag. Will Peacock finished third. In the Chargers Division, Max Hennebaul of Monroe took the lead on the opening lap. Over the next two laps, Hennebaul faced some pressure from Woodstock's Hayden Swank, while Zac Bacon and Bob Anderson fought hard for the third position. Ultimately, Hennebaul shook off the rivals to find Victory Lane. A thrilling 20-lap race followed in the Semi-Pro Division. Davis Rochester of Lebanon, TN led the opening laps of the contest with LaGrange's Jason Treschl right on his bumper. Treschl gave Rochester a few taps but could not complete the pass. However, Treschl's "no quit" attitude paid off as he took the lead on lap 13. Coming towards the end of the feature, Rochester caught up with Treschl and battled him side by side for position. Rochester completed a last lap pass exiting turn 4 to get past Treschl to win the race. "I saw him get tight there at the end", said Rochester of Treschl. "I was getting tight, but I knew I could hold on to him and wait long enough and just get to the bumper of him and I'd be good." Rochester continued, "I definitely dug deeper. I knew he was quicker, but I had to hold onto his bumper there and wait for the last lap. I knew I had the car just holding onto it at the end." In the GRT Racing Driver Development Outlaws Division, Locust Grove native Blaise Maddox led the field after the green flag with Marietta's Kenny Brady right on his tail. Brady completed a pass on Maddox to take the lead on lap two. However, Maddox would not give in so easily. Maddox and Brady battled for over half of the race for the lead with the pair exchanging positions a handful of times. But when all was said and done, Brady would walk away with back-to-back wins. Seasoned veterans climbed on the track for the Masters Division feature race. Bill Plemons Jr. raced his way out front of Robbie Woodall. 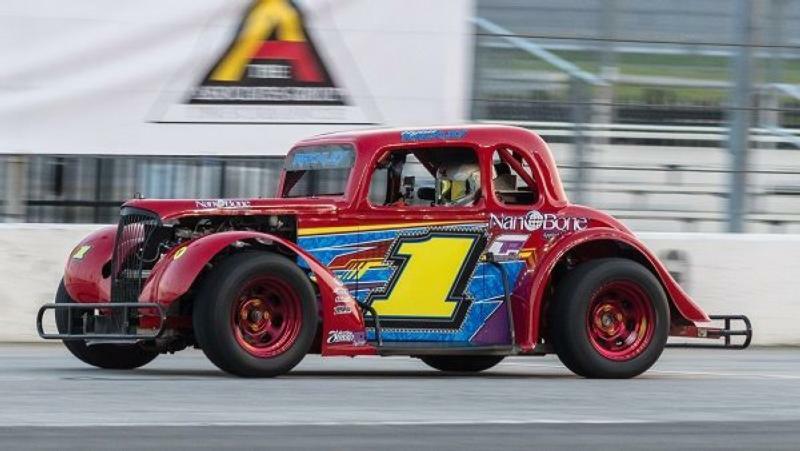 As Plemons drove away, Robbie Woodall fought off Mark Swan for the second place position, while Wes Potter and Dennis Hecht fought for the fourth spot. Woodall dug deep to catch up to Plemons and battled him for several laps for the lead. Plemons found speed on the straightaway and pulled away from Woodall, earning him his first win of the 2018 season. "Robbie and I have a lot of respect for each other like a lot of the other racers", Plemons explained. "All these cars have different combinations, we all run the same kind of motors, springs and shocks, but we can play around with these gears. So Robbie played around with some gears last week and so I played around with some this week, so the tables got turned, so I'll be here next week to see what happens." The friendly rivalry between Plemons and Woodall will continue next week as both drivers are tied in the points standings so far this season with one victory apiece. Drivers stepped up their game in the VP Racing Fuels Pro Division feature. With Stockbridge's Jensen Jorgensen in a backup car, his competitors saw a chance to take advantage. Right out of the gates, Canton's Dawson Fletcher grabbed the lead from Jorgensen and Griffin's Cody Hall. Hall, itching for a victory fought off Jorgensen while trying to pass Fletcher off of Turn 3 early in the race. Jeff Holden, Rafe Slate, and Russell Fleeman all raced for fourth behind the battle for the lead. Fletcher and Hall battled back and forth, even scraping and sliding up against each other on the closing laps, but it was not quite enough for Hall as Fletcher walked away with the victory. In the Bandits Division, Suwannee's Carson Ruark was forced to forgo his lead at the beginning of the race due to technical issues. McDonough's Kelley Puckett inherited the lead. Puckett stayed out front for the remainder of the race and captured the checkered flag, fighting off all fellow racers that dared to try to take the lead. The final event of the evening featured the Associates Group Insurance Young Lions Division. The race was Austin MacDonald's to lose as he led from the get go. MacDonald ran with the lead while Ryan Rackley filled his rearview mirror. MacDonald blocked Rackley for a few laps until Rackley found a gap on the inside of MacDonald to steal the top position midway through the race. Rackley shut the door on a possible win for MacDonald as he commanded from the front all the way to the finish. The 2018 season continues with week 3 action next Thursday, June 14 and will run each Thursday night through July 26, before wrapping up with a special-edition Saturday Championship Night on Aug. 4.